1920 Montreal house: Front hallway. Is it the recession, or simply the turn of generations that sees old houses released onto the market? Yahoo has lately run a lot of real estate stories, which makes one wonder whether the agencies are paying for online exposure. Journalistic standards aside, unrefurbished houses are living time capsules, and show how much life has changed in the past hundred years. In many of these real estate advertisements, 'haunted' is now shorthand for 'old' or 'not renovated,' and seems to add sensation to sale value. 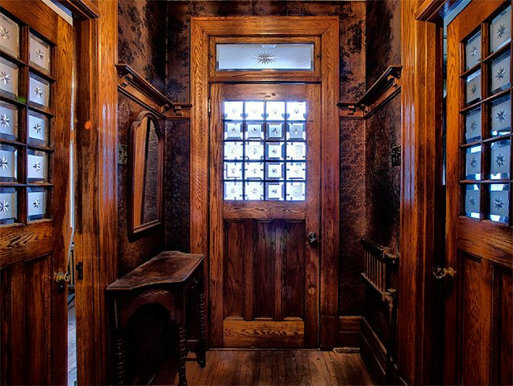 Hand-crafted and hand-carved aspects of old houses, evidence of lost or dying traditions of craftsmanship, are considered to have a 'ghostly' aura in our pre-fab days of machine-made mod cons. Similarly, in the photos from a Montreal house shown here, the shadows of religious worship on the bedroom wall, which once gave people comfort against night evils, are now the source of Millennial superstitions. See more photos of this extraordinary house below the jump. Click here for all my posts on nuclear themes.